Restoration services are 'made to order' and we must offer a quotation based on the quantity of work to restore your model to its former glory. Please click below to request a quote. 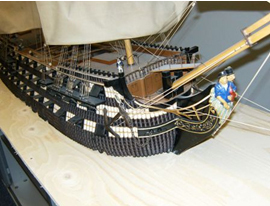 Our restoration services are designed to replenish model ships that have degraded either due to damage or simply over time. 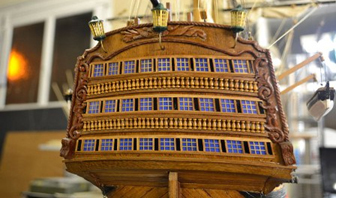 We are passionate about restoring ship models to their former glory and take great pride in our work. We promise to never compromise the original model in any way that interferes with your expectations; for example, we will not change the features of the model if they are special to you. 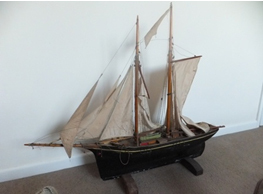 Please contact us if you have any enquiries regarding a model ship of yours that may need restoring. 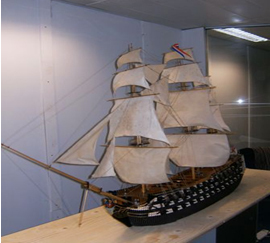 All restoration work is completed in our UK workshop by our master model maker who has over 30 years experience in model ship building and restoration work. We have completed numerous restoration projects with an overwhelmingly positive response from our customers. Below are just a few examples of projects we have completed. Please feel free to click the specific model to see more images of the project. This 2 masted schoonerfrom the beginning of 20th century is quite typical of the restoration work that we receive. There was not much damage to the mast and spars but the main hull and sails needed attention. 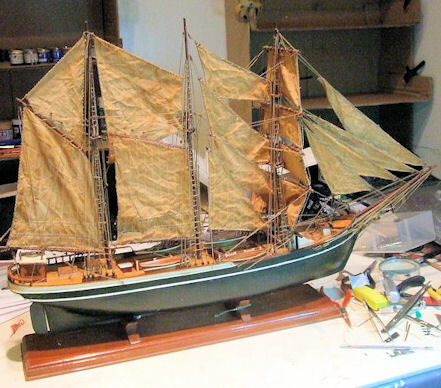 Our restorers started work having carefully studied the ship plans and the method of production of the model. The sails, masts and deck work were taken apart. The wood throughout was treatedwhen the paintwork and varnish was removed. A new set of sails was made in keeping with the aged look and matching riggings. Lastly aa presentation stand with an antique finish was made to set off the model. 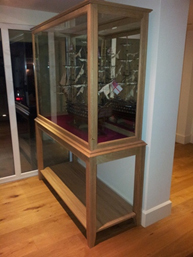 The comment we received from the client, "The model and I have both arrived home in one piece - the ship didn't move all the way home! Many thanks for your help this morning and for making such an excellent job on the model - I'm extremely pleased with the results." 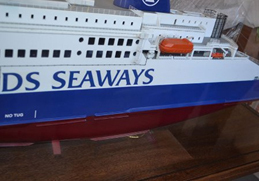 The re-branding of 4 cruise liners really challenged the skills of our model makers. 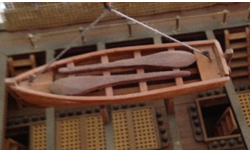 The actuals ships had new propellers installed and the models ( 1500 x 550 cm) had to be modified also. The actual process of restoration had our model makers repairing broken railings, pipes, small life rafts, the main hull had to be repainted so sanding and preparing the hull for the new coat of paint. Lastly the new logos and decal work had to be made, approved by the client and applied to the models.
" Sainaz, Good evening I have just returned from leave and would like to thank you for the return of the models, they are exactly now as we had hoped for and will be displayed in your passenger areas. 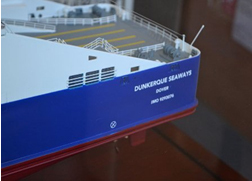 Whilst it took a long time, it was appreciated that you took every effort to get them correct.Please pass my thanks and appreciation to your model maker on behalf of DFDS and would be happy for you to use as reference if needed." 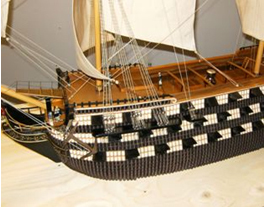 The imagination of our model makers were really put to the test with this restoration. 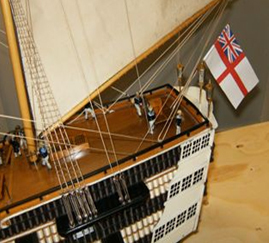 I would describe this restoration as a makeover, the HMS Victory ship model was of good quality but certain aspect of the ship model was letting her down, in particular, the stern. By improving the finish and look of the stern the whole model instantly appreciated in value. 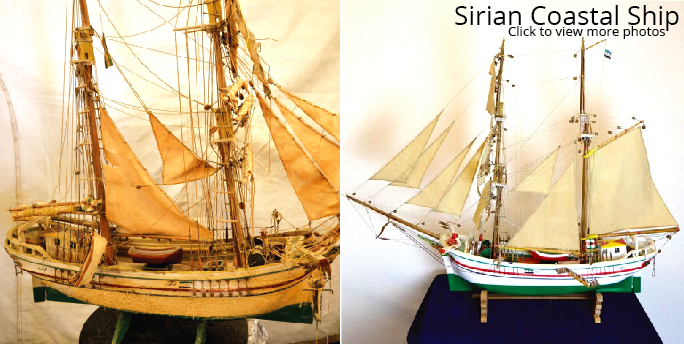 • and the piece de resistance was to refashion the stern of the model. "That looks great, thank you, Plamen." 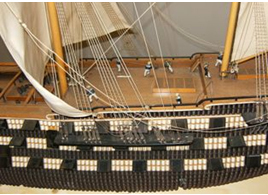 The small white and black cotton reels, used to line the hull, are said to have been left over from the construction of a dolls' house presented, by Messrs. Coats, to Queen Victoria. This would most probably have been in 1887, the year of Queen Victoria's Golden Jubilee. The model is clearly the work of a professional ship modeler. 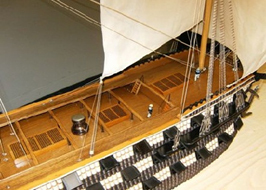 Whilst much deck and other detail appear to have been deliberately omitted, the model does contain numerous nice features, including: the rails on the main and fore mast tops; the nickel plated capstan; the railed platform across to the bowsprit; and the use of white cord to represent carving on the upperworks. 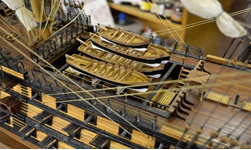 The most interesting feature of the model, of course, is themany hundreds of smallturned white and black cotton reels – wound with the same colour threads - which have been used to decorate the hull. These are said to date to the late 1880s, and to have been made at Coats' Paisley mills. There is no reason to doubt this statement. In this respect, the model would have made a wonderful advertising vehicle for Coats' products. This was most probably the model's intended purpose. The cotton reels, which line the hull, are interspersed with the gunports. These incorporate lids, made of painted metal, and truncated cannon barrels. 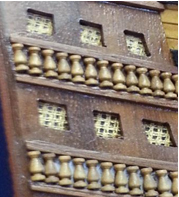 The same painted metal used for the gunports was also used for the two decorated entry port structures. In addition to the sails and cotton on the reels, the model contains two other textile items. At the stern there is a white ensign of post 1801 design. At the top of the mainmast pole head is a red, white and blue pennant. Generally, the model is in sound condition, although it has suffered from dirt encrustation and some damage. Most damage has occurred to the small cotton reels on the hull, to the spars, to the sails, to the gunports, to one of the entry ports and – to a lesser extent – to the rigging and the stempost. It is recommended that the core approach to work on the model be to conserve what exists, and only to restore broken and damaged sections. It is not recommended – for instance - that the non-extant staysails be added, as it is not known whether or not these ever existed on the model. 4. Re-stitch the detached/partly detached square sails to their yards. These include the fore topgallant sail, the fore topsail, the main topsail, and the mizzen topgallant sail. 24. Re-form the shape of all sails and attempt to remove creases. The above list does not include the removal of the large sheet of safety glass on the front of the display case. This will have to be undertaken by a specialist glazier, and arranged for by the client. Above is an example of a common repair problem. 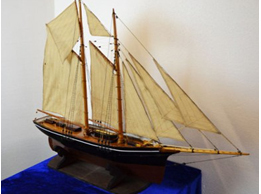 The model was on display when a shelf above it collapsed, crushing the masts, bowsprit, sails and rigging. There was also some minor damage to the deck railings and other parts. When the model was received for repair, the rudder was also missing and had to be fabricated from scratch.